For Better Result: As we offer unlimited attempt for full version of SAS Certified Base Programmer Practice exam - A00-211, we recommend strongly to practice as much as possible and before your actual exam. Your continues practice helps you to score outstanding in your actual A00-211 exam. 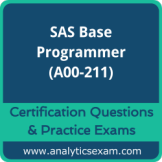 Premium SAS Certified Base Programmer Questions bank contains 520+ questions, Premium Practice Exam will populate questions randomly from this question bank. All the questions from premium question bank will be covered easily in 10 to 12 practice exam attempts. However the more you practice, the best will be the result in real exam.